September is Childhood Cancer Awareness Month and some kids with cancer - and their families - got to spend a fun night at Petco Park on Tuesday. 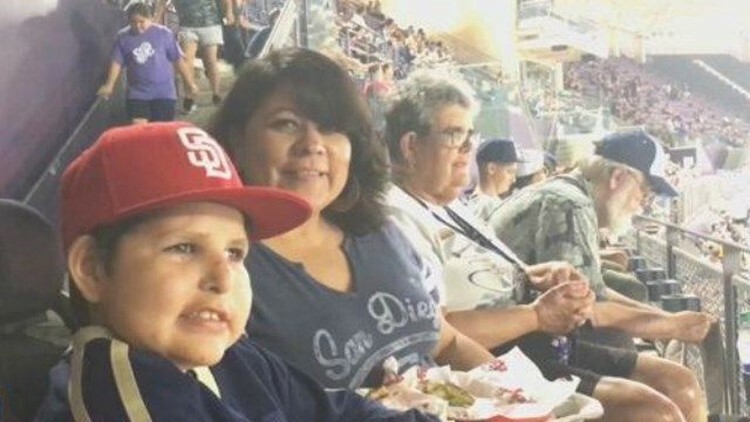 SAN DIEGO (NEWS 8) — September is Childhood Cancer Awareness Month and some kids with cancer - and their families - got to spend a fun night at Petco Park on Tuesday. They got to take in the Padres-Cardinals game thanks to a local non-profit and a nationwide tour. "Everyone is my favorite player, I just don't have one favorite player they are all my favorite players," said 16-year-old Aldo Aguilar who has been fighting cerebral cancer since he was three years old. Aldo is now blind but you wouldn't know it as he looked out on the baseball diamond at Petco Park. Aldo is part of the Friends of Scott Foundation - a local nonprofit that helps kids with cancer and their families - which teamed up with the Youth Cancer Baseball Tour. "I think it is super great because I don't have to think about school, or any homework," said Aldo. Greg Durfee from Colorado founded the baseball tour in 2010 after his nephew died from cancer. Durfee went from living on L.A.'s Skid Row to scoring many homeruns - taking 1,600 kids with cancer to baseball stadiums across the country. "I see a lot of hope and family memories being created right in front of my eyes," said Durfee. Youth cancer not only impacts the child but their family too. "It's amazing, as a family member, knowing he is happy and knowing we are able to share the experiences with him ," said Aldo's cousin Sergio Perez Tunajero. That's why no one sits the bench for this game. "It's really cool that he is not in the hospital and it's a day we can have fun as a family," said Aldo's family member David. News 8 met Aldo last year, seeing him again this year, keeps fans cheering to strike out childhood cancer.